The C3 Tactical Concealment Carrier is designed for use with your existing concealment ballistic panels. The C3 is our tactical equipment carrier that features a 360° MOLLE system providing officers with versatile configuration options. 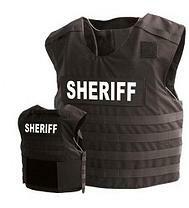 Designed for protection when the situation escalates beyond your patrol vest and additional equipment is warranted. Manufactured using extremely durable 500 denier nylon and handcrafted in the USA. The C3 is also available with a fixed pocket configuration, custom designed with your choice of four (4) sewn on pockets. Available options include Level IIIA Soft Armor Ballistic Inserts and a full assortment of MOLLE pouches. Loop area for ID placard placement. Can be used with new or existing concealment armor panels.